Solar panels are an excellent investment in Rhode Island. They outperform many traditional investments at a much lower risk. The word “Investment” gets thrown around a lot when people talk about spending money. Many people say they are “investing” in a new car or updated kitchen. These items are useful and have real benefits. However, they often have a poor return on investment. You do not get more money out than you put in. In addition, some items continue to require valuable money and time from you during your ownership. 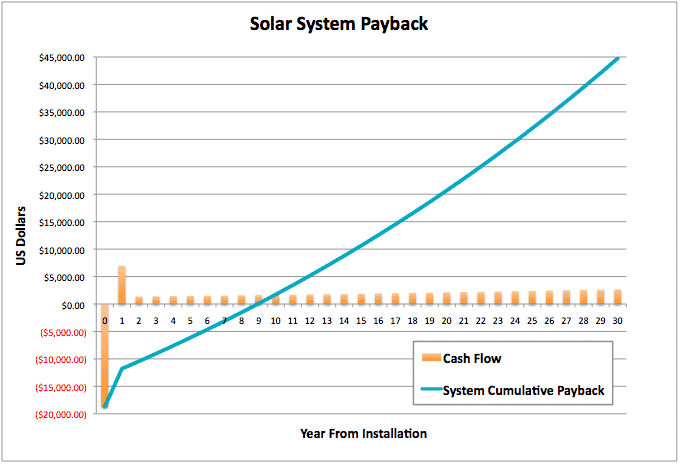 Installing solar in Rhode Island is truly and investment with easily quantifiable returns. The fuel source of your solar power, the sun, is predicable. The technology that converts it into electricity, the solar panel, is well tested. We can accurately estimate how much electricity you will produce, what that electricity will be worth, and when the system will pay you back for the cost of installation. The annual rate of return for solar panels in Rhode Island can ofter be well over 14%. This high return on investment comes at a very low risk. The amount of sun that hits a solar array in Rhode Island varies little from year to year. Therefore, your expected solar electricity production will not change significantly year to year. You will not find this type of low risk return on investment in a stock or mutual fund. By installing solar power on your property in Rhode Island, you will be producing a commodity with real value: electricity. In doing so, you can achieve an excellent return on investment and spend less on the energy you use to run your home.